How and why should I clean glass before firing it? Glass should always be cleaned before it is fired in a kiln. Cleaning glass removes problem-causing contaminants like glass-cutting fluid, oils, minerals, salts, dusts, fibers, sticker residues, pen marks, and fingerprints. These contaminants may be visible in the finished glass and may even cause devitrification, the growth of crystalline structures on the glass, if they are not removed from the glass before firing. Do not use a cleaning agent that contains detergent, as they can cause an ion exchange on the surface of the glass that can lead to a process called "weathering". Also, do not use a cleaning agent that contains ammonia or denatured alcohol, as these can leave behind residues that cause devit. We recommend a product called Spartan Glass Cleaner, a mixture of water, isopropyl alcohol and acetic acid. 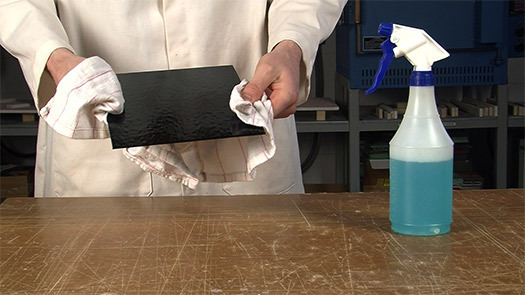 To learn more about cleaning recommended cleaning supplies and practices, please read our short article Glass Cleaning Basics or watch our free video lesson on Glass Cleaning.